Congratulations on your decision to allow us the opportunity to compete for your home lifestyle needs. While most companies spend all their time doing whatever it takes to be the biggest or the most-awarded, here at SA Building & Remodeling, we simply focus on being the BEST. If awards happen to be offered to us, we'll gladly accept. Rest assured, you will always be able to count on SA Building & Remodeling to provide you with the kind of products and service you'll be proud of and recommend to your family and friends. We are confident that we can significantly help you with the design, budget, and give your family all the value you deserve. Yes, by using quality materials and service. We fully know and understand the concerns and questions most people have at this early stage of the process of choosing the right remodeler! Remodeling your existing home can be an overwhelming decision youll have to make. Remodeling your home is all about whom you can trust; its about your relationship with the firm you will select. Remodeling your home is not about choosing the lowest bid. This is the place your very own children will grow up and a save place for your family. Yes, the place where your memories will be built. At SA Building & Remodeling, Co., we provide full service from design through construction. We have over 30 years experience in the remodeling business. Our goals are to provide you the home you dream of, at an exceptional value for your money. We strive to build a relationship that makes the entire process both successful and exciting. We are Your Contractor for Life® its part of our name and reputation. About 70% of our business comes from past customers and recommendations. We love what we do for our customers and we do it everyday! President & Director of Customer Relations of SA Building & Remodeling, Co.
A resident of Texas, Rudy Nino is the CEO of a successful residential and commercial remodeling and consulting company specializing on remodeling. Well known as SA Building & Remodeling, Co.
For over a quarter of a century Rudy Nino has been known as Your Contractor for Life. Rudy has been awarded the Remodeler of the Year for five consecutive years  since 1998 for his outstanding achievements in the industry. Rudy has over 30 years of experience in all phases of construction including sales, estimating, planning, production, and business management. His diverse experience in remodeling and his business skill have made him a leader in the field. Rudy has received many awards during his career and his remodeling work has been showcased by several prominent trade publications. He has been recognized for his participation in the City of San Antonio Home Improvement Advisory Board since 1998, the National Association of the Remodeling Industry (NARI), and the Greater San Antonio Builders Association  Remodelors™ Council,’ having the position as the local President for two consecutive years and two years as the VP of Membership. He is a 2003 Charter Member and member of the Board of Directors in the NARI San Antonio Chapter. "We are quite particular of who we choose to work on our investment. 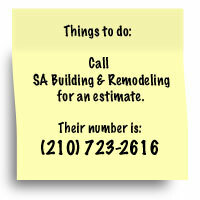 We would like to thank you and will highly recommend SA Building & Remodeling. Your professional attitude is reflected in the quality of your work. Your ideas were a positive addition to the appearance of our home. Thank you once again and look to doing business again in the near future." "I hired SA Building and Remodeling Co. to remodel the 75-year-old home. The historic house, was vacant for years and in desperate need of an overhaul. I knew he [Rudy Nino] could do it right.."
"This letter is to recommend without reservation the professional services by Mr. Rudy Nino ... during the previous three years. Mr. Nino is intelligent, dependable and very fast ... quickly assess and complete any tasks he attempts and is very adapting at managing those workers whom he may assign to complete jobs." "I called remodeler Rudy Nino for advice on how to make my kitchen bigger, I wanted to keep my family in the same area. So down went the back exterior wall with a 400-square foot glass room addition. Mr. Nino was the right man for the job." "I was very pleased with the work that was done, it came in several thousand dollars under my expected costs."